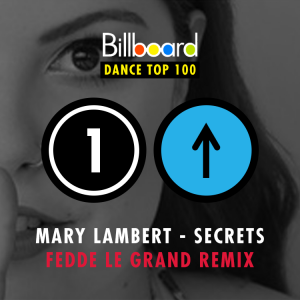 Fedde's Secrets remix went number #1 on the Billboard Club Chart!!! Having been in the charts for 10 solid weeks the remixes to Mary Lambert's Secrets have now made their way to the peak position. Check out these super flattering compliments Fedde got on his remix of this Mary Lambert track in particular and his recent remix work in general!! "Fedde's remix was an integral source for the music's achieving of its prominent stature. Le Grand's versions not only captured the attention of his core fans but also aroused interest from deejays who had previously not programmed one of his orchestrations. I have previously been involved with music where Fedde's remixes have been part of the package and they've always served as an asset to that particular melody."